The geotechnical group is currently leading a long term study, funded partly by industry and partly by government, to improve design procedures for foundations on expansive (reactive) soils. This project involves a combination of field, laboratory, and theoretical work, and is also looking at the complex ground movements that are caused by mine subsidence. 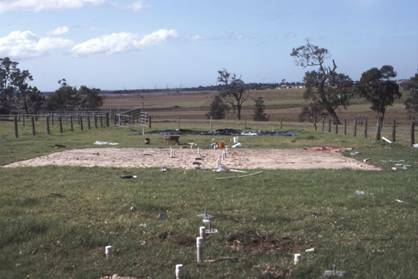 As part of the field study, a major field site has been established near the relatively new suburb of Maryland, approximately 10 kilometres west of the City of Newcastle. In addition to this major site, 20 minor sites have been established at various locations in the city of Newcastle. The data gathered at the minor sites is less detailed than the data gathered at the major site, but serves to illustrate the geographic variation of reactive soil behaviour. Above: The Maryland Reactive Soil field site. This work has been supervised by Stephen Fityus and Scott Sloan. Work is continuing on the development of numerical models for predicting soil moisture changes and ground movements. A direct comparison of the predicted and measured movements and moisture content changes at the monitoring sites, particularly beneath covered areas, will enable the models to be tested and adapted. A numerical model of neutron diffusion in soils in being developed to assist in the interpretation of neutron-probe data collected over many years.